Quiet Fascism has no purpose other than to aggregate more power, maintain its secrets and lay waste to anyone who questions its Imperial authority. So my little-visited Wikipedia entry was minding its own business, not bothering anyone, until I dared to criticize the Clinton Foundation. The next day, my Wikipedia entry was taken out and shot by a mysterious "editor." It was just coincidence, right, that my Wikipedia entry had been available for years without offending anyone, and then suddenly it's deleted the day after I dared to criticize the Clinton Foundation. Actually, I criticized all foundations, but that doesn't matter; what mattered is that I criticized what cannot be criticized. I guess that drone strike on my car was coincidence, too. I called a contact in DoD (Department of Defense) and he said it was logged as a "targeting error." Of course. Ok, so the drone strike is a "joke," meaning it's no joke to the thousands of people who are murdered by U.S. drone strikes outside the U.S. It's a "joke" like Hillary Clinton asking if Wikileaks honcho Julian Assange could be eliminated by a drone strike so he could no longer release data that might embarrass her or her campaign. Though it's not yet illegal to ask questions, it's certainly dangerous to do so. But let's take a chance and ask: how do we know that drone strikes haven't targeted critics of U.S. policy? Do you really think the DoD, White House, CIA, NSA or State Department would admit that drones liquidated a "threat" whose "crime" was criticizing U.S. policies? I hope you're not so naive as to believe official assurances that drones only kill people who were just about to blow up Baltimore, only we nailed them just in time. With "threat" being defined by those in authority, what's to stop those with power from rewarding their cronies and punishing their critics? This is the essence of quiet fascism. Quiet fascism has no party affiliation; it is a mindset shared by both parties that views power as a tool to reward friends and punish enemies. It has no moral foundation or indeed, no purpose other than to aggregate more power, maintain its secrets and lay waste to anyone who questions its Imperial authority. This is the mindset of the Clinton machine. Intimidate, threaten, bribe, do whatever it takes to silence those who ask questions or release answers to unwanted questions. The entire Establishment has been bought off, seduced or intimidated into silence. I wonder what was said to FBI Director Comey to persuade him to soil himself and the legitimacy of the FBI. It must have been a doozy. Is quiet fascism so petty as to delete a critic's Wikipedia entry? The depressing answer is yes, it is; the pettiness of quiet fascism knows no bounds. Recall what Amy Sterling Casil said about the Clinton Foundation's penchant for revenge: "Any nonprofit professional in the U.S. can look at the Foundation’s own statements, tax filings and financial reports and see there is something wrong. No one who works for a nonprofit right now should do so because of the Clinton penchant for revenge..."
In other words, critics pay a steep price for questioning authority. Your grant is mysteriously denied, your promotion deep-sixed, your security clearance cancelled, your name is besmirched by rumors, your tax records are audited, your servers hacked, and so on. The weapons of quiet fascism are always plausibly deniable. The Jack Ruby Gambit is a classic tool of quiet fascism. It wasn't us who did those nasty things to you; it was a loyal cadre who took it upon himself to destroy your files, reputation, career, etc. on his own. Quiet fascism erodes the legitimacy of critics and snuffs out inquiries that threaten those in authority. So we have the FBI debasing itself, the White House lending its authority to cover up what needs covering up, mainstream media ignoring inquiries and leaked documents, and so on. Hillary Clinton is not an aberration; she is the perfection of quiet fascism:authority's sole source of legitimacy is its power to reward toadies and punish critics. Many people are voting against someone in this election, generally Donald Trump or Hillary Clinton. Rather than vote against a person, vote against quiet fascism, which means voting against both parties, which are after all two sides of the same coin. There aren't many places you can question authority and not pay a price for doing so.The voting booth is still confidential (so far as we know). A vote for the Green Party or the Libertarian Party is not wasted; it's a vote against the quiet fascism of the American Establishment. 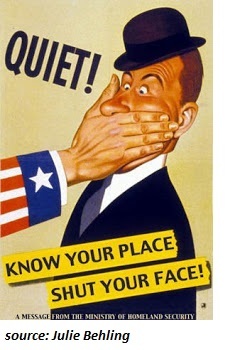 Speaking of quiet fascism, here's a question for Wikipedia: what safeguards do you have in place to stop quiet fascists from pursuing their penchant for revenge on Wikipedia?What's to stop quiet fascism from using Wikipedia as their playground? I have contributed money to Wikipedia for many years, and as a contributor and user, I think my readers and I deserve an answer. Who is this "editor" who deleted my entry? What's the foundation of his authority? Can he be investigated and his "editor" rights deleted? If not, why not? It's a fair question and deserves a fair answer. If you have to censor other citizens to "win," what exactly have you "won"? UPDATE: according to a reader who is a Wikipedia editor, my entry was deleted long before yesterday. Nonetheless, There are a lot of issues raised by this experience that I want to explore in future posts. UPDATE #2: I just received an email from Wikipedia stating the entry has been restored-- thanks to you, dear readers! Many thanks, I am blessed and humbled by your quick support. Join me in not caving into quiet fascism by becoming a $1/month patron of my work via patreon.com. Thank you, Michael H. ($5/month), for your outrageously generous re-subscription to this site-- I am greatly honored by your steadfast support and readership.